The summer LOG 2015 included the Executive Summary of the final written evidence from the Board of Friends of Ecological Reserves (Board of FER) sent to the National Energy Board (NEB) in May 2015. We focused our concerns on the 19 Marine Ecological Reserves located in the shipping corridor of the Kinder Morgan Trans Mountain Expansion Project (KM/TMX). We recommended to the NEB that they include conditions similar to those applied to the approved Enbridge Northern Gateway project with regard to ecosystem monitoring, research, funding and reporting. 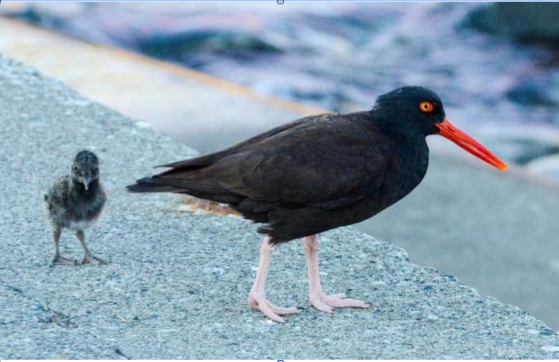 Black Oystercatcher- Shorebirds were not included as indicator species in TMX assessment. We also proposed an industry supported Marine Research and Monitoring Endowment Fund with a $9 million annual budget as a permit condition, with guidance and oversight provided by a multi-stakeholder Trustee Council. This annual budget is based on what Alaskan’s spent, in today’s dollars, in response to the Exxon Valdez spill March 24, 1989 (26 years ago). The NEB did not include any of the Board of FER’s recommendations for permit conditions in the 145 draft conditions for KM/TMX released in July. In this article we compare the Enbridge approach to marine research, to those conditions proposed by FER for KM/TMX. We proposed a multi-stakeholder Trustee Council as being superior for directing research in the broader public interest. We believe that this is more acceptable than oil industry directed research programs which would be slanted more to oil industry interests. As intervenors in the on-going Kinder Morgan Trans-Mountain Expansion project, the Board of FER reviewed the conditions imposed on Enbridge and expected at least some level of equivalency which we reflected in the 12 conditions we recommended for the KinderMorgan/Trans Mountain Project. We see our recommendations as essential because of the enormous increase in transportation of diluted bitumen (dilbit) in the Salish Sea if the Kinder Morgan project is approved. A central reason for designating Ecological Reserves is to preserve representative and special natural ecosystems thereby providing research and educational opportunities. (See: Ecological Reserves Act. http://www.bclaws.ca/civix/document/id/complete/statreg/96103_01#section2 Purpose 2. (c) areas that serve as examples of ecosystems that have been modified by human beings and offer an opportunity to study the recovery of the natural ecosystem from modification. In the draft conditions proposed to NEB by the Board of FER, we maintain that Kinder Morgan has a responsibility, over the life of their project, for marine ecosystem research in general and that the oil industry in particular bears significant financial obligations for benchmark ecosystem monitoring in order to establish baselines for recovery should a spill occur. This research must include learning more about the effects of heavy oil in the marine environment. Ecological Reserves (ERs) alone do not provide a sufficient network of monitoring sites and many of the research needs cannot be met in ERs alone. Therefore the Board of FER proposed a more encompassing approach that allows other stakeholders a voice, together with industry and government to set research priorities. We were proposing to enable NGOs as well as government scientist and industry selected consultants, to propose research into marine systems. The Enbridge-funded Royal Society report is an opportunity to look at research priorities through the lens of the terms of reference set by the oil industry. It is good that the oil industry, in this case Enbridge, voluntarily proposed marine research during the hearings process and agreed that they have some financial obligations for marine ecosystems in the pre-spill period, as a cost of an oil exporting company doing business. It is also good that the NEB panel of the Northern Gateway transferred the voluntary commitment to binding permit conditions for Enbridge and that Enbridge found wider support from Oil Producers to help cover costs linked to meeting their permit conditions. There are so far, no voluntary conditions that have been put forward by KM/TMX nor the requirement of such conditions by NEB. Arguably NEB is allowing fewer obligations than those imposed on Enbridge. Since the human population and marine enterprise on the shores of the Salish Sea is greater and the species at risk and the biological productivity is also much greater, this lowering of the industrial obligations for KM/TMX is not logical, as well as not acceptable. If anything, in our opinion, the obligations placed on KM/TMX should be much higher than those placed on Enbridge. The Times Colonist article indicates that the Royal Society acknowledges research gaps, however the degree of risk the NEB is willing to accept is up to them – but more research is needed. From the Board of FER’s point of view, the risk the Enbridge Panel was willing to accept is lower than the risk the KM/TMX panel is willing to accept. This is based on the differences in conditions between these panels for similar projects. The NEB panel of KM/TMX has placed no conditions on KM/TMX for any marine obligations whereas the NEB Enbridge panel placed several obligations on the Enbridge proposal. The following are quotes from the Royal Society report’s executive summary. A panel of leading experts on oil chemistry, behaviour and toxicity reviewed the current science relevant to potential oil spills into Canadian marine waters, lakes, waterways and wetlands. The review, which examined spill impacts and oil spill responses for the full spectrum of crude oil types (including bitumen, diluted bitumen and other unconventional oils), is among the most comprehensive of its kind. It surveyed scientific literature, key reports and selected oil spill case studies, including tanker spills, an ocean rig blowout, pipeline spills and train derailments. The Panel also consulted industry, government and environmental stakeholders across the country. Research is needed to better understand the environmental impact of spilled crude oil in high-risk and poorly understood areas, such as Arctic waters, the deep ocean and shores or inland rivers and wetlands. Ecosystem impacts and recovery were not clearly present in the oil industry dictated Terms of Reference but are of great interest to the public as are the impacts and resilience of marine ecosystems. The pubic interest can better be served if the setting of the research agenda is not solely left to private firms with oil exporting interests. FER has proposed that industry, together with governments and First Nations is the appropriate group to balance research efforts. Corporate research interests do not entirely match public research interests yet both must be addressed. Recommendation 3 above is of concern as it is a call for “A national, priority-directed program of baseline research” and appears to be an off-loading to the Canadian public of the research costs for what should be an oil industry obligation. This off-loading of costs to the public is inconsistent with concepts more widely accepted such as polluter pays or a no net loss type of approach when there are private interests pitted against public assessed value and public liability. To that end, the conditions proposed by the Board of FER for KM will more fairly place the costs of research directly onto Kinder Morgan to ensure that multiple stakeholders’ research priorities and the best projects able to meet broader public goals are selected. Figure 1 shows the proposed governance structure the Board of FER is seeking from the NEB as a condition on Kinder Morgan for a more equitably focused research and monitoring program in a pre-spill environment. Figure 1: Endowment Reporting and Multi Stakeholder Board as proposed by FER to the NEB in our Final Arguments Report. There has been dissatisfaction with the KM-TMX process expressed by many of the intervenors and some have dropped out. The Board of FER hopes the NEB will see the benefit of additional provisions along the lines that we have advocated. There may however be a review since there is a new Federal government and the Board of FER is of the opinion that the status quo is inadequate and that the approach of Enbridge is an improvement. There is still a strong case to be made to provide for permit conditions that will force Kinder Morgan to shift the status quo to a more inclusive multi-stakeholder approach with a greater industry role for managing risk and understanding of the marine environment. With just the status quo, there is a lack of transparency and an inadequate learning / communications environment between the public, industry, governments and the NGO community. This can and needs to be changed. The Board of FER has provided a road map toward meaningful change and we are seeking support for such a shift. We are confident that our approach, if accepted by the NEB could help to shape a more constructive dialogue.